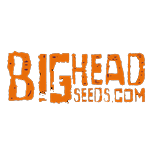 Big Head Seeds - Bruce Banger. Free US delivery. Bruce Banger is BigHead Seeds version of the legendary 'Bruce Banner #3'. Bruce Banger is a sativa-dominant Kush x Diesel cross. Her taste is a combination of earthy diesel tones undercut by a strong Kush sweetness. This bright green plant has crystal-laden buds with orange pistils, and is both fungus-resistant and pest-resistant. Her high THC level produces a fast-acting effect: energising and creative, often giving rise to the munchies.